Hybrid motors differ from solid and liquid rockets in that they combine a solid fuel with a liquid oxidiser - hence, they are said to be a "hybrid" of a solid and a liquid rocket. The hybrid fuel is contained within the combustion chamber, and the oxidiser is fed from an oxidiser tank. The oxidiser tank can be part of the same structure, or a separate component. 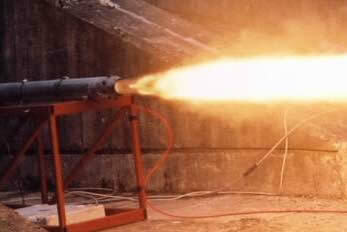 The fuel for a small hybrid rocket motor is generally a tube of combustible material (most frequently Polyethylene or Acrylic, although even cardboard is used in some cases!). The tube is known as the fuel grain. The hole down the centre of the tube is called the fuel port. For a larger hybrid rocket motor, multi-port grain geometries are common, where there will be several separate ports in the fuel grain, with oxidiser injected down each port. In High Power Rocketry and Amateur Rocketry, by far the most common oxidiser used with hybrid rocket motors is Nitrous Oxide (sometimes known somewhat incorrectly as NOx). Nitrous oxide (N2O) is an oxidising liquified gas and is clear and colourless. It has a slightly sweet odour. At room temperature, Nitrous Oxide is stable and inert. It is classified as a non-flammable gas. Nitrous Oxide supports combustion and can detonate at temperatures in excess of 650° C (1202° F). Nitrous Oxide is probably the easiest oxidiser to handle due to its benign nature compared to other oxidisers, as well as being relatively easy to acquire, due to there being no special restrictions on its sale or use, and due to it being self pressurising. Nitrous Oxide was the oxidiser used in the hybrid rocket motor (built by SpaceDev), which propelled the Manned SpaceShip One rocket plane into Space on 3 occasions, to win the Ansari X-Prize in 2004. Nitrous Oxide is also the oxidiser being used in the hybrid rocket motor which will propel the Virgin Galactic SpaceShip-2 manned spacecraft. Nitrous Oxide was also used in the Environmental Aerosciences Hyperion Sounding Rockets. Nitrous Oxide (N2O) - Nitrous Oxide, also known as Dinitrogen Monoxide, NOx, or laughing gas, has a boiling point of -89.5 degrees Celsius at 1 atm, and is normally maintained as a liquid at a pressure of 54 bar. Nitrous Oxide has a molecular weight of 44.0 and a density of 1222 kg / m3 at 20 degrees. The critical pressure and temperature of Nitrous Oxide is 7.27 MPa and 36.6 degrees Celsius. Liquid Oxygen (O2) - Liquid Oxygen, also known as LOx, has a boiling point of -183 degrees Celsius at 1 atm. Liquid Oxygen has a molecular weight of 32.0 and a density of 1265 kg / m3 at 20 degrees. Nitrogen Tetroxide (N2O4) - Nitrogen Tetroxide has a boiling point of 21.2 degrees Celsius at 1 atm. Nitrogen Tetroxide has a molecular weight of 46.01 and a density of 1903 kg / m3 at 20 degrees. In a hybrid rocket motor, liquid oxidiser is fed into the combustion chamber from the oxidiser tank, where it is ignited by an ignition source such as a pyrotechnic igniter. The fuel is then ignited and burned in the presence of the oxidiser, where it vapourises, and burns along the length of the fuel grain. The rate at which the fuel burns, is called the regression rate, and is measured in metres per second (m/s). The regression rate then, is dependent on the mass flux and the length along the fuel grain port. A hybrid motor differs fundamentally in terms of combustion behaviour compared with solid and liquid rockets, in that the Oxidiser to Fuel ratio (O/F), varies along the length of the hybrid fuel grain, i.e., it has an axial dependency. In a liquid rocket, the injectors generally inject both the fuel and the oxidiser at one end of the combustion chamber thus there is no axial dependency. In a solid rocket motor, there is no injector head, and every particle is bound of fuel and oxidiser, thus ensuring the O/F remains pretty much constant. The combustion chamber in a hybrid rocket motor not only provides the location for propellant combustion, but also contains the whole fuel grain. The length of the combustion chamber is determined by the fuel grain configuration (e.g. a single port or multi-port fuel grain configuration). Also, the longer the combustion chamber, the more stable the combustion, since the propellant has more opportunity for even mixing. From checking sources such as Spacecraft Propulsion Analysis and Design (Humble and Larson) and Rocket Propulsion Elements (Sutton), as well as following through with the calculations, a single cylindrical port geometry for a hybrid fuel grain, provides more volumetric efficiency for any high power or amateur rocket, than does a multi-port geometry. The disadvantage of the single port configuration however, is that it generally requires long length to diameter ratios compared to a multi-port configuration. The multi-port configuration can be made quite short and compact, with length to diameter ratios of between 3-7. In general however, for high power or amateur rocketry, the single cylindrical port geometry configuration is probably the best choice for most hybrid propulsion applications. Direct injection into the fuel grain port. Injection into a pre-combustion chamber. For hybrid rocket motors on the high power and amateur rocketry level, where a single circular port geometry is most frequently used, direct injection of the oxidiser is the best approach, since there is no need to inject multiple oxidiser streams down multiple ports, and hence less requirement for a homogenised oxidiser stream from multiple injector nozzles. Injection into a pre-combustion chamber in a hybrid rocket motor is more useful for larger hybrid motors, or hybrid motors where a multi-port geometry is used for the fuel grain, since multiple injectors are more common, and even mixing of the oxidiser stream needs to be achieved before it is passed over the fuel grain. Post combustion chambers are used in hybrid rocket motors to enable more complete burning of the combustion products before the combustion products are expelled through the nozzle throat on into the nozzle and the exhaust. Post combustion chambers are less widely used than pre combustion chambers since they can cause quite severe erosion of the combustion chamber in the region of the post combustion chamber,and the benefit of using the post combustion chamber can often be outweighed by the increased mass of the insulation required to prevent burn through of the post combustion chamber. There are a variety of methods of igniting Hybrid motors. On larger hybrid rocket motors, a solid rocket motor pyro grain, or a complete small solid rocket motor attached at the injector end of the hybrid rocket motor combustion chamber are used to ignite the fuel and oxidiser. On smaller hybrid rocket motors where a plastic fill line is used to fill the oxidiser tank, a variety of methods of ignition are used, pyrovalve/pyrograin with the fill line running through a hole in the pyrograin, PIC wrapped around the plastic fill line, and Gaseous Oxygen filling of the combustion chamber combined with High Current electrical ignition. Where a metal fill line is run into the oxidiser tank through the combustion chamber, Gaseous Oxygen high voltage spark ignition can also be effected. N.B. Information presented on these web pages is for information purposes only. The author of these web pages does not take any responsibility for people harmed or injured, or for damage caused by hardware resulting from information contained within these web pages.